Hotels-New-Zealand is a group of independently owned and non-related hotels, motels and serviced apartments providing accommodation located across Dunedin New Zealand. Hotels New Zealand allows you to deal directly with the hotels giving you the best possible rates for these Dunedin hotels. Book your accommodation online directly with the hotels in Dunedin and save !!! The Best Western 555 on Bayview offers studio & 1 bedroom apartment accommodation in Dunedin on the magical South Island of New Zealand. It is ideally located at Anderson's Bay, the gateway to the rugged beauty and wildlife wonders of the Otago Peninsula. 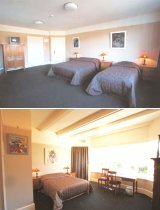 The Best Western 555 on Bayview offers quality Dunedin accommodation, conveniently located near to the main route through Dunedin, within 3 minutes drive of the Octagon, which is the heart of Dunedin art gallery, restaurant, bar and shopping precinct. The Best Western 555 On Bayview provides all types of travellers with discount accommodation in Dunedin and also features a wide range of modern amenities and services such as direct internet access, disabled facilities, free car parking, guest laundry, room service, tour desk, bbq, garden and baby cots available. Corporate business facilties include a business centre, faxing faciilties and photocopying service. 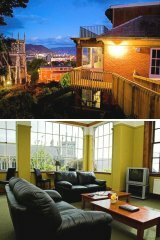 The Brothers Boutique Hotel offers travellers a special place to stay in the heart of the Dunedin city, New Zealand. A unique stately residence which has been completely refurbished into a boutique hotel this discount Dunedin accommodation provides a genuine heritage experience. All of the hotel room have new ensuite bathrooms, cozy heating and are situated only six minutes walk from the city centre, restaurants, shops and bars. The Brothers Boutique Hotel Dunedin provides a mixture of convenience, history, charm and elegance combined with spectacular views of city & harbour, ample free off street parking, complimentary broadband internet and a complimentary continental breakfast served in the hotels dining room or ground floor balcony. Situated on the main street next to cafes and shops the 526 George Street Boutique Hotel is one of Dunedin's most centrally located accommodation venues. This boutique Dunedin accommodation provides corporate and holiday makers with an array of facilities including Sky TV, conference and function facilities, guest laundry, restaurant, outdoor dining area, tour bookings and courtesy coach available for pick-up and drop-off from the railway station and bus terminal. Budget Dunedin accommodation in a wonderfaully central boutique style hotel. The 315 Euro offers unparalleled comfort and style with a warm welcoming ambience to ensure you feel instantly relaxed and at home. Enjoy the space, privacy and luxury iof this Dunedin accommodation complete with the latest technology, design and flair that this newly completed motel apartment provides. Nestled in the very heart of city centre the Euro Dunedin Hotel offers guests the choice of staying in luxury studio suites or in a fully self contained deluxe 1 bedroom apartment. All of these Dunedin accommodation rooms are stylish and modern, offering the very best in facilities and services that will surely make your stay a comfortable and relaxing one. They include a fully equipped kitchen, microwave, ensuite bathroom, hair dryer, bathrobes, large screen LCD/plasma TV, DVD player, Sky TV 40+ Channels, wireless broadband internet, underfloor heating, washing machine, dryer, ironing facilities, double glazed windows and a balcony or patio. One of the newest luxurious Dunedin accommodation properties is the Bluestone On George. It is situated in the heart of the city centre and offers a perfect blend of style and comfort. This Dunedin accommodation provides relaxation by tasteful decor and a variety of amenities that are all tastefully presented and catered to your every need. Guests can enjoy the remarkable views from the apartments over the city and harbour, which is rich in history and culture. Bluestone On George offers the latest in technology, architectural design and ambience with patios or balconies off every room and various outdoor courtyard settings. The superb main street location of this Dunedin accommodation places it only 200m from inner city shopping, cafes and restaurants, 300m from the University and 500m from the Hospital. At the Bluestone On George there is a gym, beverages available in the guest lounge, secure off street parking, charge back facilities at local restaurants, business facilities and high speed internet access. The Farrys Motel provides quality Dunedin accommodation at great value for money discount rates.All of the motel suites and serviced apartments at the Farrys Motel & Apartments in Dunedin offer spacious and comfortable self-contained accommodation which has been specifically designed to ensure peace and privacy. The rooms at the Farrys Motel Dunedin include a fully equipped kitchen, microwave, shower, hair dryer, phone, broadband internet, 6-channel Sky TV, DVD player, hush glass windows, electric blankets, central heating and ironing facilities. These is also a children's play area, barbecue, free guest laundry, off-street car parking, bus parking and secure storage facility at this exceptional Dunedin accommodation. The Leviathan Heritage Hotel Dunedin in conveniently located in downtown Dunedin close to bars, cafes, restaurants, movie theatres, art gallery, settlers museum, brewery, casino, Cadbury World and the main shopping area. This quality discount Dunedin accommodation is only 200 metres from the railway station and features bar, lounge, writing area, guest laundry, email service, messahe centre, luggage storage, off street car parking, Sky TV and 24 hour check-in. Accommodation in Dunedin for the budget conscious travller to New Zealand's picturesque South Island. 555 on Bayview is one of Dunedin's newest hotels and invites travellers to this part of southern New Zealand to experience the friendly service and multitude of local attractions in and around Dunedin. With brand new modern facilities including guest laundry, same day dry cleaning, off street car parking, in-house library, continental breakfast and a selection of studio and family sized apartments the 555 on Bayview Hotel is the place to stay in Dunedin. Situated on the main street next to numerous cafes, restaurants and shops the George Street Boutique Hotel provides both leisure and business travellers with budget accommodation in a completely smoke free environment. At the George Street Hotel Dunedin there is also modern business facilities available, conference and function facilities, an outdoor dining area, tour booking desk and Sky TV in each of the hotel rooms. The Albatross Inn Dunedin is a beautiful edwardian house on the main street close to the city centre. This affordable Dunedin accommodation comfortable bedroom with private bathrooms, TV, phone, cooking facilities and free internet and email. 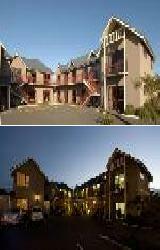 Great value for money bed and breakfast accommodation in a wonderful central Dunedin location. The luxury family 1 and 2 bedroom executive apartments at the Alhambra Oaks Motor Lodge are brand new and feature a fully equipped kitchen, Sky TV, spa bath, balcony and private courtyard. This discount Dunedin accommodation is adjacent to the Northern Oaks Park and close to Otago University, Polytech, hospitals, the Dunedin museum, shopping centre and many restaurants. At the Belle Vista Hotel Dunedin guests are provided with non-smoking studio and family apartment units, daily servicing, spa bath, Sky TV, video & CD players, guest BBQ, private off street car parking, guest laundry, internet station and room service breakfasts. Located in the heart of Dunedin this luxury hotel accommodation is also close to the Otago University & Halls of Residence, Polytechnic, College of Education, Dunedin Hospital, Botanic gardens, Logan Park sports complex and city shopping. With a range of budget hotel accommodation rangind from single and double hotel rooms through to executive suites complete with spa bath Cargills Hotel Dunedin has something for everyone. There is also conference facilities, off street car parking and an award winning a-la-carte restaurant and bar with 24 hour room service at the Cargills Hotel Dunedin. The spacious corporate accommodation at the Heriot Lane City Apartments will easily fill the gap between a small and over priced motel room and the comfort of your own home. These fully self contained serviced apartments are positioned in a quiet setting surrounded by mature trees, yet are in a central location only 500 metres walk from the Dunedin city centre, Dunedin Hospital, Otago University and Moana Pool. The Motel on York is easily Dunedin's premier 5 star accommodation. Completely smoke free the executive hotel suites and studio & 1 bedroom apartments are ideally located in the heart of the city centre. The Motel on York is surrounded by the many restaurants, cafes, shops and theartres that the vibrant city of Dunedin is famous for. Nestled in the expansive landscaped grounds overlooking Dunedin Botanical Gardens and historic precinct the Skyline Leisure Lodge has been recently renovated to a fabulous deluxe standard. This luxury Dunedin accommodation is also handy to the Otago University, Dunedin Hospital, restaurants, shops, cafes and includes full wheelchair accessable suites.